How to save streaming video to MP4, WMV, AVI, MKV, FLV on Windows/ Mac? Download, capture, record streaming videos with high quality and convert to popular video formats. Nowadays, it is easy to enjoy funny videos, movies, TV shows, sporting events, educational videos on video sharing websites, like YouTube. Streaming videos can be played easily in any browser, but most websites do not offer downloading options or apps. How to save streaming videos? Which is better, plug-ins or third-party apps? Which program makes it easy to download streaming videos with highest quality? How to download movies from Amazon, Hulu or Netflix for watching videos offline? The following guide will show you an ideal streaming video downloader and detailed guide on how to save streaming videos. Acting an all-in-one streaming video downloader, Bigasoft Video Downloader Pro helps to download videos from popular video sharing websites, like YouTube, Facebook, Dailymotion, Vimeo, VEVO, MTV and more. Even F4F sites are fully supported. Besides, Bigasoft Video Downloader has been added a new build-in Streaming Video Recorder which is able to help you capture movies, TV shows from Hulu, Netflix and Amazon. How to Save Streaming Videos with Bigasoft Video Downloader Pro? 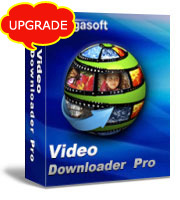 Firstly, download and install Bigasoft Video Downloader Pro. There are two different versions for Windows and Mac users separately. And the two versions are fully compatible with the latest OS. Pick the right version to download and install. Batch download videos from more than 100 popular video sharing sites including YouTube, VEVO, Vimeo, etc. Record live streaming video or TV show with build-in video recorder. Keep videos in best quality. Fully support 4K, HD 1080P, 720P and 3D online videos. Download video from F4F sites or merge downloaded F4F to any popular formats you like. Convert local video or audio files to any format you like. A large range of video formats are supported, including MP4, MP3, AVI, MKV, WMV, WebM, FLV, etc. Download videos directly is easy. 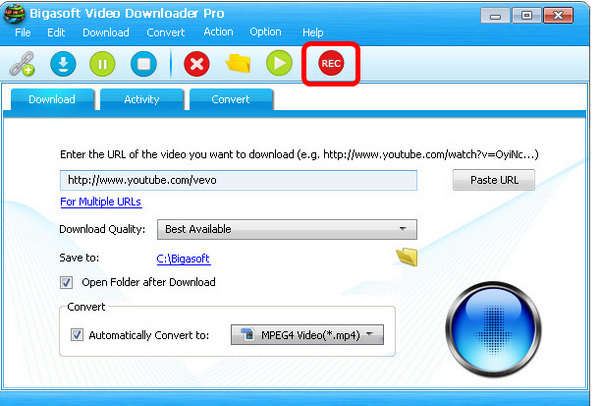 Please follow the steps of downloading high quality videos on Mac/Windows. In this guide, the following article will show you how to record live streaming videos easily. Launch the the downloader and click the red "REC" button on the top menu to start streaming video recorder. When you start Bigasoft VideoRecord, a dashed green line appears around the recording area. To move the recording area, click and drag the compass icon inside the recording area to a new location on the screen. To resize the recording area, click and drag a handle on a corner of the recording area in or out. 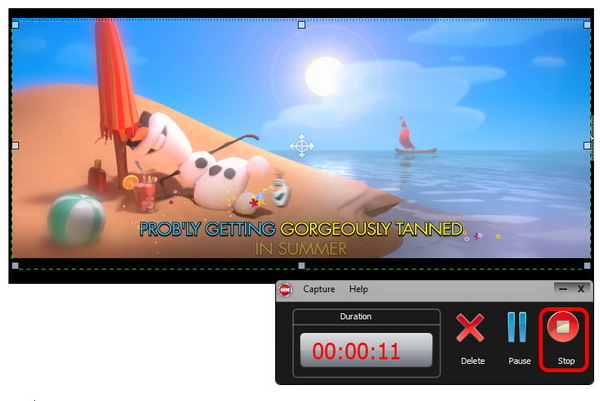 Resize the recording area to suit the play window of the video sharing site. Simply click "record" button to start the streaming video recording. During the recording, you can select "Delete" to start a new task or choose "Pause" if you need to skip some part and continue the recording later. When recording period is over, click "Stop" button to stop recording and preview window will pop up and you will be able to save or delete the recorded video. After the recording, you can preview the captured video to find if it meets your need. If not, just click "Delete" button to delete the former recording and return to the record panel to start a new task. 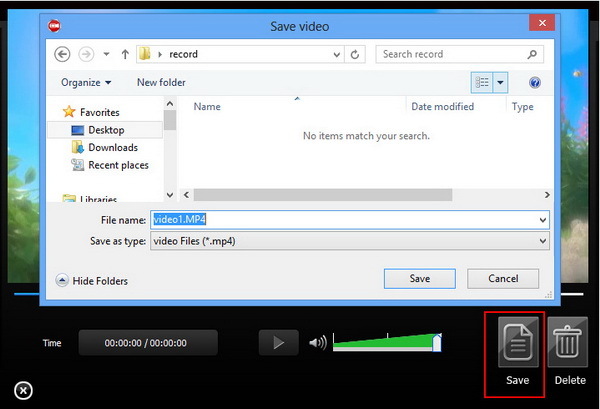 If you are satisfied with the recording, choose "Save" and a window will pop up to let you select destination path to save the recorded MP4 video. Acting as an easy-to-use streaming video recorder, this tool turns your computer into a flexible video capture and recording device. It will save the output to MP4 format which is widely used on both Windows and Mac OS. If you would like to save the streaming video recording to other formats, just open Video Downloader Pro again and change to Convert tab. Then you can add and convert it to other formats, like MKV, AVI, MOV and more.